I snorted very elegantly laughed and told her it was a root vegetable… and that it looks like a large white carrot. She had never bought or eaten a parsnip in all 27 years of her life. And at that moment, I realized that the first time I ate one was 4 months ago. In those 4 months I learned that I am INTO parsnips, like v v into them. 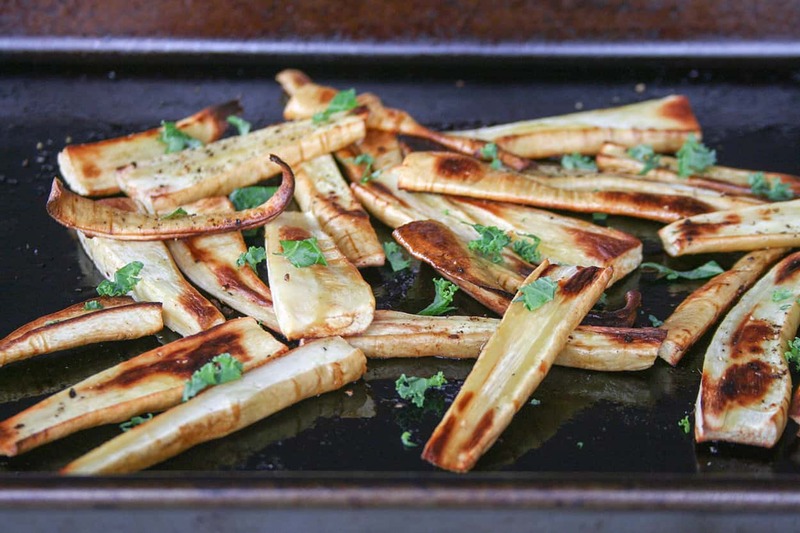 Roasting parsnips brings out a sweet flavor which I love. And, I mean, who doesn’t want to eat fries?! 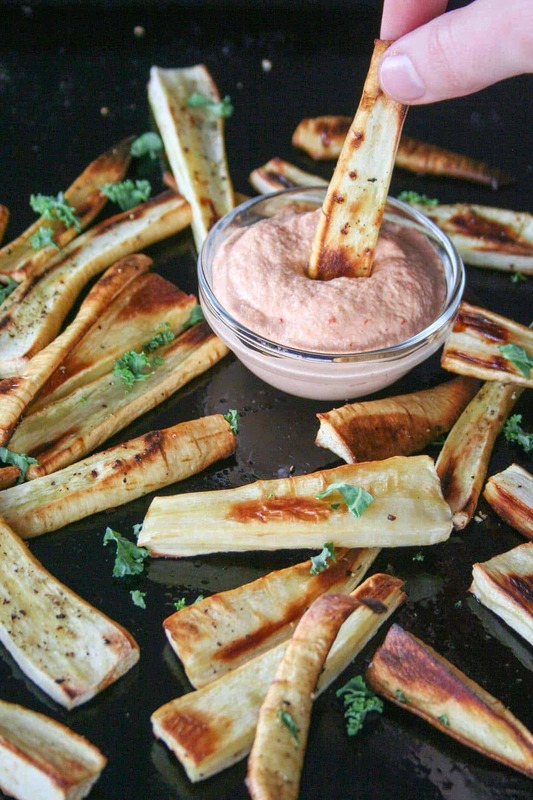 But the sweetness needs something to balance it out – vegan chipotle dipping sauce. Yes! The base of this sauce is made from cashews, so it is vegan, paleo, and Whole30 compliant. Don’t you want to dive right in?! Tell me: Do you know what a parsnip is? Make these Baked Parsnip Fries, post a picture on social media and use the hashtag #imhungrybynature for a chance to be featured! 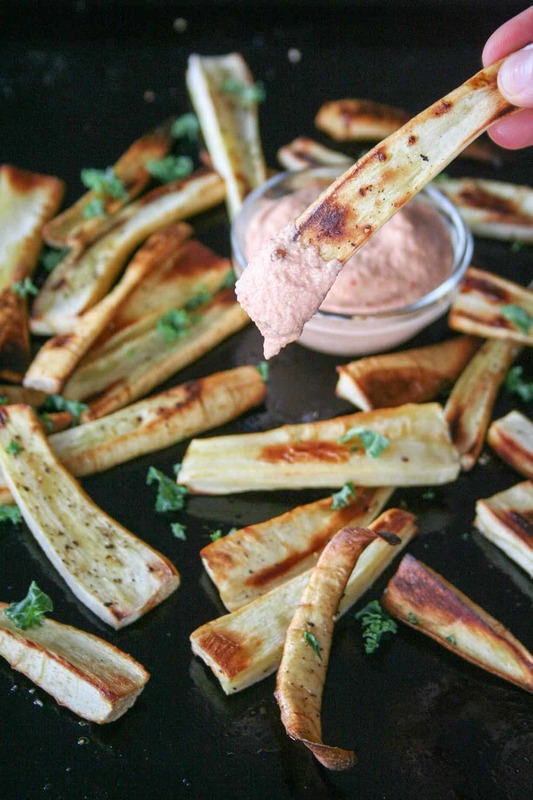 Slice parsnips into fries – approximately 1/4 inch thick by 2 inches – and place on a baking sheet. Spray fries with olive oil and sprinkle with salt and pepper. While the fries are baking, prepare the chipotle dipping sauce. Place drained cashews, water, chipotle peppers, and salt in a food processor and process until smooth. omg I am going to make these ASAP! 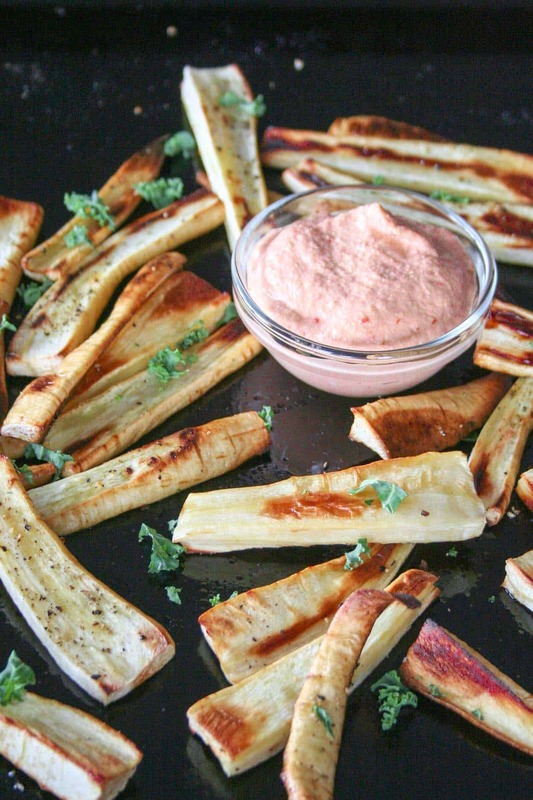 I just started eating parsnips last fall and I absolutely love them! 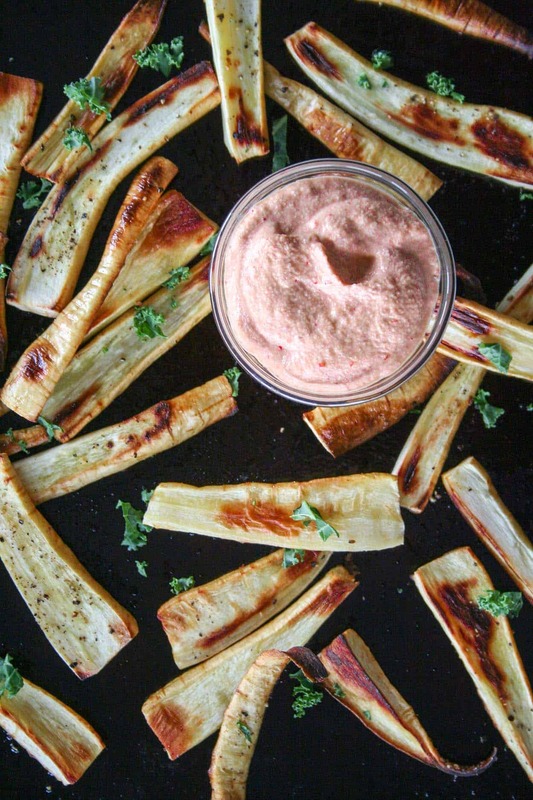 They are definitely getting up there on my favorite root vegetables list 😉 And that dipping sauce looks delicious too! Awesome recipe!! Thanks Brie! And I’m glad you discovered them too… are they just a new vegetable?! Or have we both been missing out for years? Love love love parsnip fries! That chipotle sauce sauce amazing. Aren’t they just the best?! And I have been SO into cashew cream lately… so why not add chipotle? I don’t eat Parsnips very often… But I know I loveeeee them! So um, yeah, at the grocery store tomorrow I am getting them! yes yes – do it! Thanks Myra – you will LOVE it! Parsnips are SO GOOD! And I love that you tried using cashews with the sauce; it looks really creamy and thick. I don’t know how it took me so long to discover them! And thanks Em – you will love the dip!